About 10" wide and 70" long, blocked. -Finished Size: About 10” wide and 70” long, blocked. 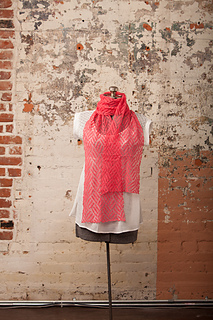 -Yarn: Jade Sapphire Lacey Lamb (100% extrafine lambswool; 825 yd 754 m/2 1/8 oz 60 g): #NY214 rose, 1 ball. -Needles: Size 2 (2.75 mm). Adjust needle size if necessary to obtain the correct gauge. -Notions: Markers (m) (optional); tapestry needle. -Gauge: 26 sts and 34 rows = 4” in Lace patt, blocked. 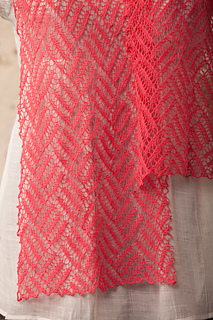 This light and airy lace stole is made with a soft and comfortable yarn in very elastic stitch pattern, combining for a perfect accessory.